BPI Sports Best BCAA is one of the newest products that BCAA rolled out which contains multiple forms of Creatine to promote better muscle mass development. BCAA, or Branched Chain Amino Acid, is an in-demand nutrient that supports the development of lean muscle mass. BCAAs have been around for a while, and it was just recently that more research has supported the importance of BCAAs in the fitness industry. In a nutshell, BCAAs are great especially with a calorie-deficit fitness regimen. BCAAs are important for lean muscle bodybuilders who take their lean muscle physiques to the limit. BPI Sports Best BCAA has made a claim that it has the best BCAA formula available in the market today. At the moment, since there’s not much data to support their claim. In fact, there’s not much competition in the BCAA industry to even bother naming which product is the best. The extremely lean muscle crowd represents quite a small portion in the fitness industry, and not all supplement marketers are interested in joining the mix. Majority of the muscle building customers are in the market for the best muscle building supplement, which contains a combination of ingredients that affect energy, nutrition, and hormones; products like NitroGenix 365 and Xtreme Testosterone. 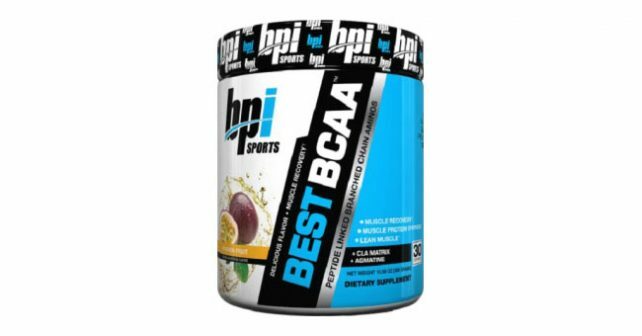 BPI Sports Best BCAA might ring a bell to some, but being the best in a category is certainly debatable. In this review, we’ll dig deeper into BCAAs and BPI Sports Best BCAA to see if there’s some truth to their claim of being the best in BCAAs. After reading several reviews on the internet, we have come across customers who found BPI Sports Best BCAA to be quite satisfactory, but not really remarkable to say that it’s the best BCAA product out there. BPI Sports Best BCAA is most notable for its flavors. Most protein shakes taste like it has been chewed and spit out, but the flavors on BPI Sports Best BCAA were quite easy to stomach. It’s not tasty, but you won’t get the urge to throw up after taking it in. Most of the people who reviewed BCAA did not experience any side effects, but they didn’t experience any immediate positive effects either. We understand that BCAAs take longer for you to notice any effects, but majority of the supplements now have combination effects that drive you into more intense workouts and keep you energized for a longer period of time. BPI Sports Best BCAA proudly publishes its main active ingredient, which is Creatine. Creatine is a popular source of amino acids, which promotes better muscle mass development. It also supplies energy to certain parts of your body – including the muscles you’re working on. The idea is to stuff your diet with creatine and your body should last longer when working out, and your muscles should develop faster. BPI Sports Best BCAA appears to have it all good on paper, having all the important creatine types to ensure top-level muscle growth. However, there’s one fundamental ingredient that BPI Sports Best BCAA appears to be missing – testosterone boosters. It’s quite a claim to be the best product in the market yet they lack the complete solution for muscle development. Any expert would tell you that hormone supplements are IMPORTANT for muscle mass development. No matter how much BCAA you take, the benefits of testosterone cannot be replaced. Don’t get us wrong, we understand that BCAAs only have its effect if it’s taken in the long run. After all, there are many sources of protein in a person’s regular diet. All we see at this point is the lack of a complete solution for muscle mass development. We still cannot discredit the missing essentials of body building in the mix. If you’re going to make a commitment as stern as pushing your body to its extreme, calorie-deficit diet, then you might want to take a little boost from your testosterone or some reliable energy-boosting substances at least.